Published on July 17, 2008 in Screenings and Super 8. 1 Comment Tags: Steven Ball. UK film and video veteran Steven Ball will be in Sydney briefly next week. The Teaching and Learning Cinema is delighted to be presenting an retrospective of his film and video work produced during the last twenty years. Lucas from the TLC first met Steven in 2003 during an Expanded Cinema research trip to London. Steven is a research fellow at the British Artists’ Film and Video Study Collection, and he helped dig through the archives to find documentation of film performances from the 1970s in London. As it turns out, Steven actually spent a several years in Melbourne from the late 1980s, shooting and organising screening programmes with the Melbourne super 8 group. In London, he is one of the organisers of cogcollective, a group which curates grassroots screenings of experimental film and video work. Steven has prepared a special programme for Sydney. You can view the whole programme in detail here. We’re very pleased to see that the programme includes Super 8 films shot in Australia, some of which he has re-edited recently, drawing together fragments of small-gauge footage in a memory-montage landscape film: The Ground, The Sky and the Island (2008). Our screening event will be the world-premiere of this work! Between the longer pieces, Steven’s programme is peppered with his “videoblog” experimental sketches from the series Direct Language. 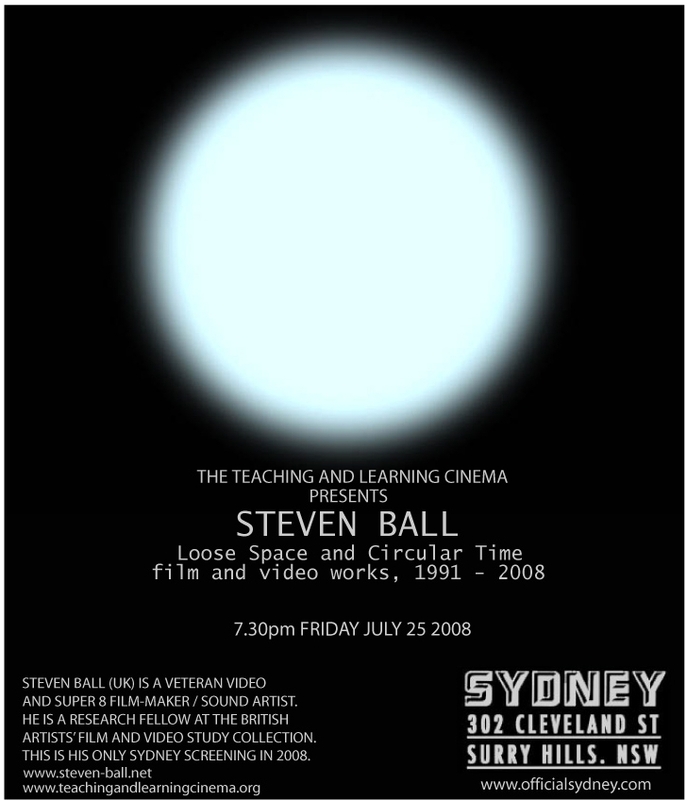 On his visit to Sydney, Steven looks forward to engaging with local film and video makers, and he will be happy to discuss his participation in the many film and activist groups which he’s been involved in for many years. I would like to announce that this event is now part of the Biennale of Sydney as it clearly shares broad conceptual curatorial themes with that event.